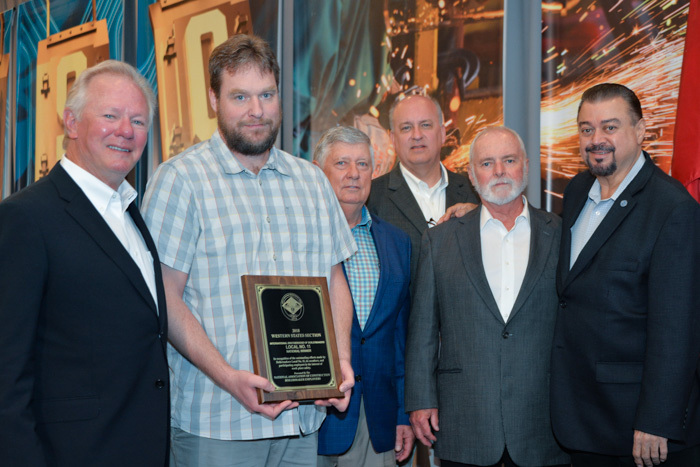 Clinton Penny, BM-ST of Local 11, accepts The John F. Erickson NACBE Safety Award on behalf of his lodge during the 2019 Construction Sector Operations conference. L. to r. are IP Newton Jones, Penny, NACBE Executive Director Ron Traxler, NACBE President Tom Shull, IST Bill Creeden and IVP-WS J. Tom Baca. The National Association of Construction Boilermaker Employers recognizes local lodges annually for their members’ dedication to making and keeping their workplaces safe. They name one nationwide winner and one winner from each of the remaining U.S. sections. To qualify, locals must have a zero OSHA recordable injury rate for the year, have worked over 100,000 man-hours and have had at least one-third of their man-hours worked by the NACBE member contractors, who submit their injuries to NACBE. Local 11 has won the top honor in the past and received a section-level award in 2018. The three lodges honored for top safety in their sections were: Northeast Local 45 (Richmond, Virginia), accepted by BM-ST Danny Watson; Southeast Local 40 (Elizabethtown, Kentucky), accepted by BM-ST Michael Autry; and Great Lakes Local 1 (Chicago), accepted by BM-ST Eric Davis. NACBE Executive Director Ron Traxler presented overall 2018 safety index data gathered from 43 reporting contractors, which revealed that the lost time injury rate decreased to .12 from .22 in 2017 — the lowest since 2013. OSHA recordable eye injuries decreased to 12 from 15 in 2017, and four locals had zero recordable injuries. A few index measurements showed upticks: OSHA compensable injury rates came in at 5.29 up from 3.38 in 2017; OSHA recordable injury rates drifted up to 1.23, from 1.20 in 2017; and compensable eye injuries came in at 102 compared to 66 in 2017. Traxler said they are exploring reasons and solutions to address the injury increases. Traxler noted there were zero fatalities in 2018. “You guys are helping the contractors to work safe, and we want everyone to come home safe,” he said.